If you suffer from swollen legs and thick ankles after a long day, this can have various causes. When you stand or sit a lot, the calf muscle pump that transports the blood from the legs through the venous system back to the heart is no longer adequate. The blood pools in the veins. This causes fluids to leak out into the surrounding tissues and the legs swell up. Poor blood return can also occur when the vessels widen at hot summer temperatures. Legs may swell up in rooms that are too hot, or in rooms with underfloor heating. The swelling mostly begins at the ankles, the lowest point of the large superficial saphenous vein. However, everybody who suffers from swollen legs should be examined by a doctor to see whether a serious venous disease lies behind the symptoms. The doctor can visualise the blood flow in the veins by ultrasound (Doppler ultrasonography). He can recognise whether the superficial veins or the system of deep veins in the legs is damaged. For example, the venous valves often do not close properly anymore, so the blood flows backwards in the veins. The blood pools in the veins and widens them. This damages the venous valves further still. 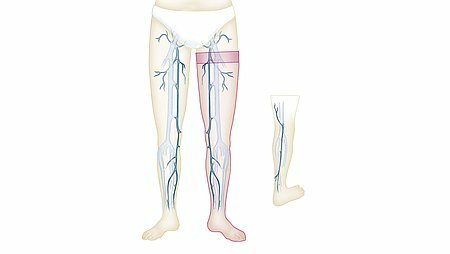 If you already have varicose veins in your legs, this is a further sign of venous disease. Venous diseases must always be treated. Click here for more information about the treatment of veins.